As hurricane Sandy approaches the east coast of the US many moms are wondering, ‘What about my freezer stash?‘. And with good reason. There is concern about what this storm will do and how long people may be without power. Many moms have worked hard to have frozen milk on hand for their babies, and the thought of loosing that liquid gold is just too much to bear. 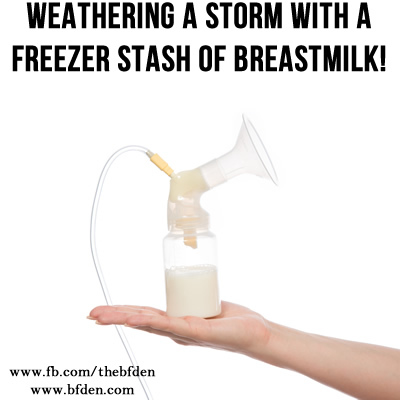 So, we know off the bat that breastmilk frozen in a full chest freezer is absolutely safe for 48 hours! Great news. The best way to protect your milk is to store it in the center of the freezer, where temperatures are more stable. This will ensure it stays frozen as long as possible. Breastmilk is still considered frozen if there are ice crystals in it or it is a slushy consistency. via HMBANA’s best practice, 2005. Wow. So even beyond 48 hours we can look for ice crystals to tell us the milk is still frozen. Wonderful news. But what do we do when the milk is thawed and there are no ice crystals left? “The data generated by the authors support the contention that milk is relatively robust. Milk that has been left unrefrigerated for less than 8 hours, or placed in the refrigerator for a day, is safe to use and retains a good portion of its nutritional value. Moreover, it appears that unpasteurized milk that has been accidentally thawed remains safe to use provided it has not been left too long in an unthawed condition. Based on these data, it appears that unpasteurized milk that has thawed in the refrigerator for up to 8 hours may be safely refrozen. Moreover, this data would seem to support the use of frozen milk to which fresh milk has been added and then refrozen. This should allow for more convenient storage and for the salvage of milk that mothers might otherwise have been told to discard. Rechtman DJ, Lee ML and Berg H. Effect of environmental conditions on unpasteurized donor human milk. Breastfeeding Medicine. Spring, 2006; 1(1): 24-26. So it looks like thawed milk CAN be refrozen if necessary. Let’s keep in mind that breastmilk is a living fluid, and is full of live cells and active immune factors and enzymes which can be, and are, damaged in the freezing process. The BEST way to have breastmilk is fresh. That is when the nutritional content is at it’s highest. The more we change the temperature the more we denature the proteins, and we loose some of those important qualities. You might consider leaving out the milk that would be used in the next 24 hours, then re-freezing the rest. Keep in mind that this is to be used for emergency situations, not on a regular basis. Since you don’t pump in a laboratory you may want to make sure the milk passes the sniff test before feeding it to the baby. Breastmilk that is bad will smell BAD and you will know. If it smells fine, it likely is. 1. Store milk in the center of a full chest/deep freezer. To help fill the freezer you can fill plastic bags or containers with water and freeze them into ice. 2. Group bags of milk into plastic container or larger bags to avoid leaking incase of defrost. 3. Avoid opening the freezer, this will allow warm/room temperature air in and speed up the thaw process. 4. Dry Ice can be added to the freezer to keep milk frozen for extended periods of time – More info can be found here. 5. 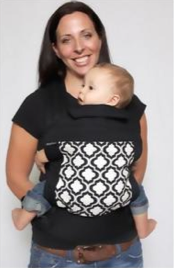 Feed your baby directly from the breast as often as possible during the power outage, and avoid using the frozen milk when proper heating isn’t possible. Stay safe and warm, and enjoy some downtime with your little ones.